The # 019 comes with a bottom gusset and poly web carry handles which make it perfect to be carried to your workplace with your lunch or even one to carry back home all the groceries from the market. It also makes for an economical giveaway at a trade fair or exhibition. Your company logo imprinted on the bag would look amazing with the natural background of the bag especially if you match the handles to your colours. We don't believe in minimums and are happy to send over a free sample. Size: 12" x 14" + 2"
We “Norquest Brands Private Limited” is a well-known entity established in the year 2002, in Ahmedabad (Gujarat, India) engaged in Manufacturing, Exporting, Trading, Wholesaling & Supplying a high quality range of Canvas Bags, Tote Bags, Cotton Bags, WineBags, Duffel Bag, Jute Bags, Drawstring Bags & Pouches. 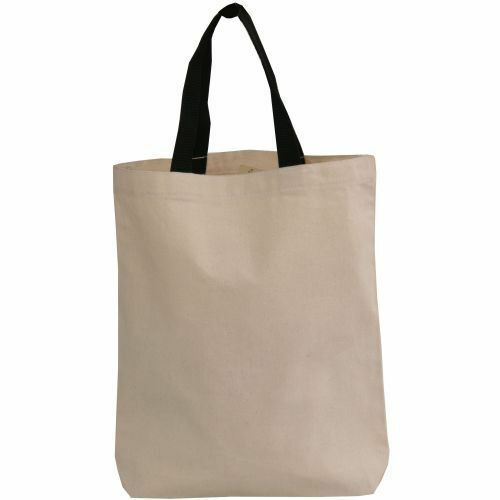 Our product range comprises Nylon Portfolio Bag, Nylon Carry Bag, Lightweight Laundry Bag, Jute Tote, Non Woven Tote Bag, Cotton Canvas Tote, etc. These bags are manufactured and precisely designed using the finest raw material such as cotton, nylon, jute and advanced stitching techniques under the supervision of our skilled professionals as per the latest fashion trend. Also, the offered bags are extremely valued by the esteemed clients for their exquisite design, appealing looks, attractive patterns and perfect finishing. Apart from this, the offered bags are available in various sizes, colors, designs and patterns as per the varied requirements of clients at affordable prices.